Cornered by Technology: Catch of the Day: Wrasse poster wins a prize at ALDinHE Conference Southampton! Catch of the Day: Wrasse poster wins a prize at ALDinHE Conference Southampton! Very chuffed to have won a poster prize (at the ALDinHE Conference) promoting the new Wrasse website. It took a fair amount of time to design and create. All the design work was done in PowerPoint 2010. What is Wrasse? Well, it stands for: Writing for Assignments E-Library. Its purpose is to help students understand what good academic writing is within the context of their discipline. This resource is on-line, so there are no barriers to learning internationally! Wrasse has seen various forms of development since 2002, so the concepts have been well established. The interface has recently been improved but lacked a new hosting space. Since I took on support of Wrasse in November 2014 (kindly offered by John Hilsdon & Joe Allison),there has been a considerable amount of time, conversations and meeting to finalise the hosting. This included the website developers (Yello Studio, Exeter) and systems experts here at Plymouth. Having Wrasse finally up and running, and winning a poster prize has been a wonderful surprise. We are currently looking to build the essay and report database so students have a much larger resource in which to benefit. 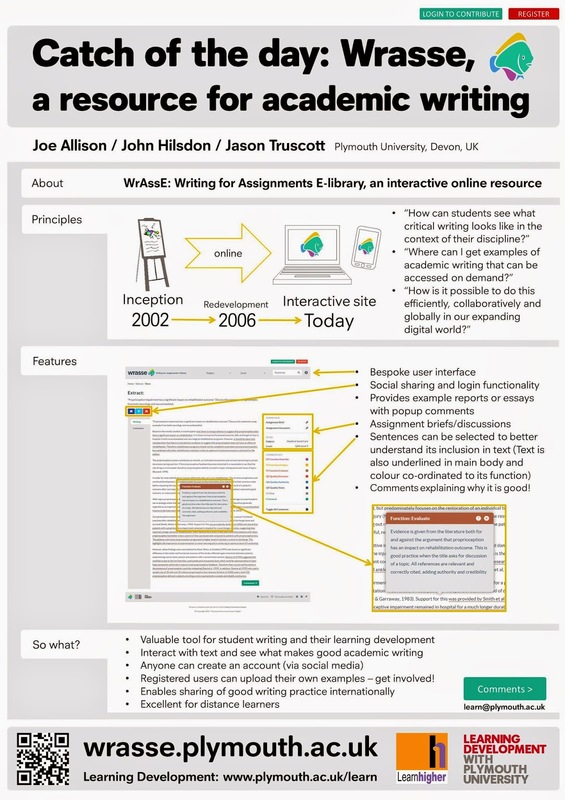 I will add that this is not just a resource for Plymouth University but also for anyone wishing to support academic writing. Wrasse also features on the LearnHigher resources website. If you are interested in what we do in Learning Development at Plymouth University, or just interested in discussing Wrasse, please visit our external site.